Ballpark Basics: A superior ballpark for an inferior team. 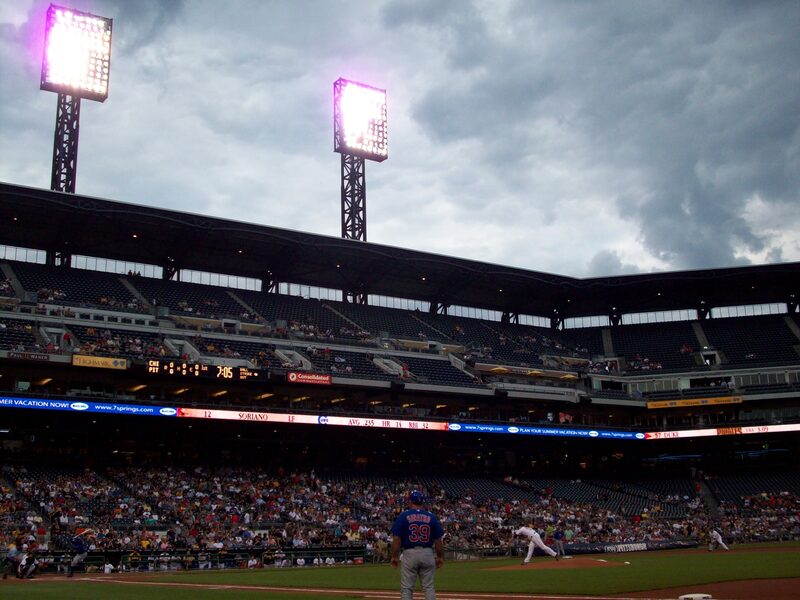 Ballpark Breakdown: There really isn’t much to dislike about PNC; in fact, this is easily our second favorite major league park (Gillian being from Chicago prefers the Cubs and Wrigley, while Jim being an O’s fan, favors Camden Yards). 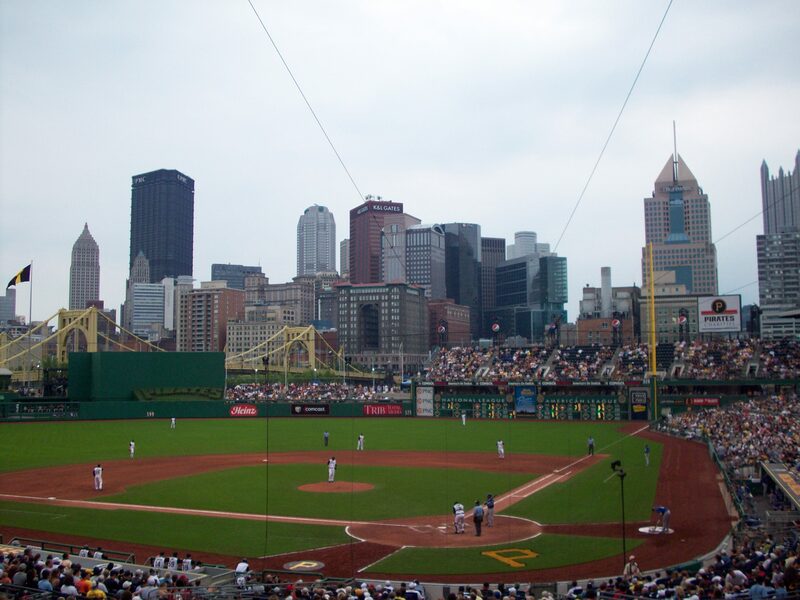 Head to the game early and cross the Roberto Clemente Bridge (aka the 6th Street Bridge) across the Allegheny River to the ballpark from downtown. For every home game, the bridge is closed to automobile traffic, there are vendors all the way across, and inflatable games and other activities are set up for kids attending the game. People without kids tagging along (like us) can head to one of the many sports bars that are across the street from the park. 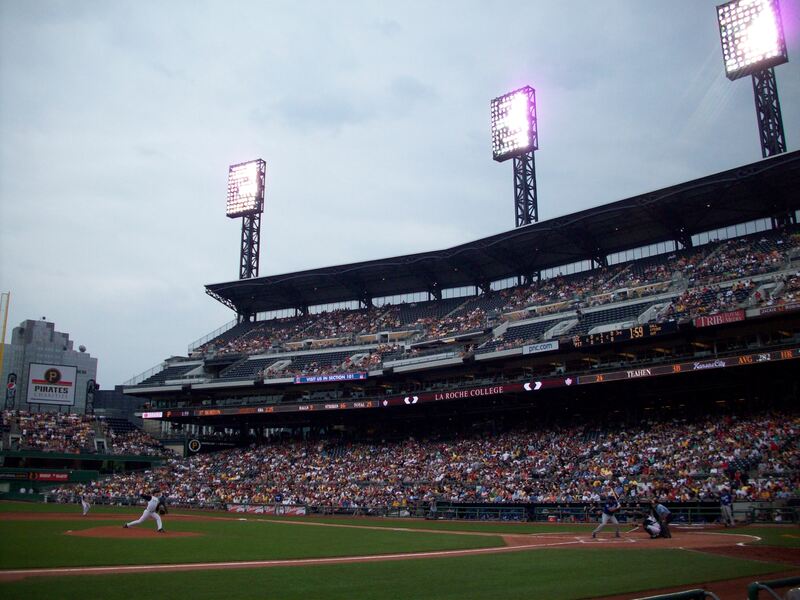 The ballpark is ringed with statues to great Pirates of the past (Roberto Clemente, Willie Stargell, Honus Wagner, and Bill Mazoroski), and the statues are just one example of how the field was designed to pay tribute to the great years of Pittsburgh baseball. The park itself is constructed from limestone to give it the same look as the fabled Forbes Field and the lights are also intended to replicate the historic field as well. They even used a portion of the original brick wall from Forbes Field to construct the river walk behind right field. Once inside, the first thing you will notice is the dramatic view of downtown Pittsburgh across the river. The second thing you might notice that it is much smaller than most new ballparks. With only two levels, active friendly mascots and a between innings pierogy race, the ballpark has a much more intimate feel than is typical for the majors. 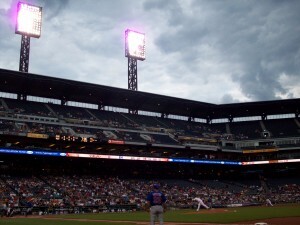 With such a beautiful and smaller capacity ballpark for a major league team, you might expect to pay a lot for tickets. However, Pittsburgh is a city who loves her winning teams and due to the horrendous level of play, and the constant trades of talented prospects, tickets are exceedingly easy to come by and significantly cheaper when compared to other major league stadiums. We scored what would only have been considered a coup in most other ballparks: 2 tickets, 2 rows off the field behind the Pirates dugout for 50 bucks. Beer Basics: Where one goes to worship on the altar of hops and malt. 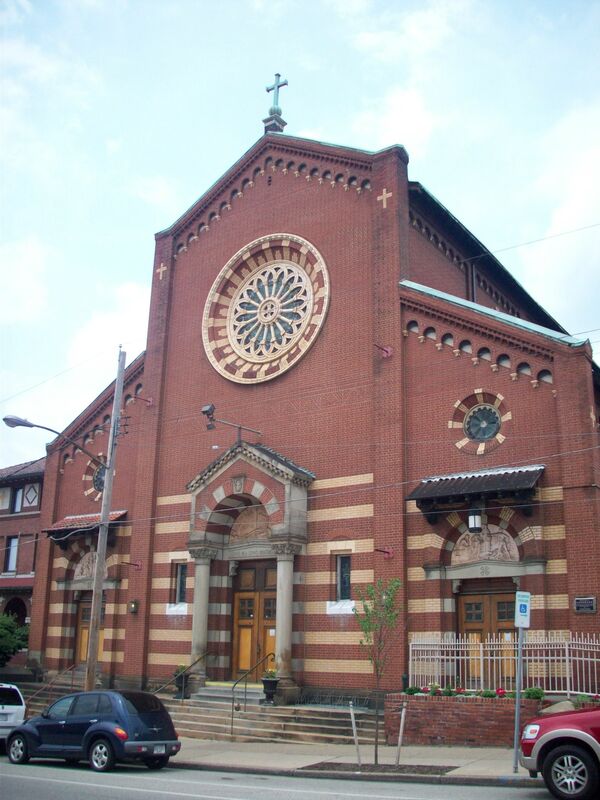 The history of the building can be summed up as a turn of the century Catholic Church, who over the course of the decade fell into hard times through fire, depression and financial difficulties and was then transformed into the Church Brew works in 1996. But the story does not do this place justice, for it is one that has to been seen to be believed. 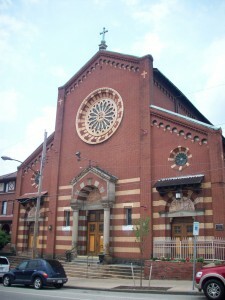 The former church of St. John the Baptist has been completely transformed. What was once a house of God is now a Mecca for those who worship fine brew and a fancy menu. What were once pews have been sawed in half to create the benches of the booths, with the leftovers used to construct the bar. The altar is still painstakingly painted with celestial blue clouds to assist in heavenly ascent, with the original lanterns and signature stained glass rose window. But today, rather than serving as the center of religious ceremony, it is filled from floor to glorious, stained glass ceiling with gigantic copper brewing tubs. There is also a large outdoor deck for happy hours and summer mingling, but we arrived at sunset so the sun streaming through the stained glass windows kept us inside. Throughout the building the transformation is amazing, but the piece de resistance is unquestionably one of the former confessionals; which now serves as the liquor cabinet. Sacrilegious? Possibly. A must visit? Absolutely. Just like much of the city, these brews draw much from German heritage. We weren’t completely wowed by any of their beer offerings, but would be interested in coming back to try some again – especially the seasonals which are constantly being refined. Pious Monk Dunkel: 4.3% ABV. Ideal for those who like a more pronounced flavor to their beer without the typical heavier alcohol and hop content of the darker lagers. This Dunkel has a very strong, dark color to it but it’s surprisingly softer and less woody than you might expect and comes with a slightly sweet wheat taste and a momentarily bitter finish. Winner of a bronze at the World Beer Festival (2000) and the Great American Beer Festival (2001). Thunderhop Double IPA 8.00% ABV– A definite woody, even slightly grainy taste from a clear, brown beer. Thunderhop has a definite orange aroma, it doesn’t have the sticky almost chewy taste of an IPA; and is much sweeter than one would expect from something with this kind of name, and from this kind of beer family. It is actually a very good beer in its own right, but someone who loves IPAs for their specific characteristics and expects to find them in the Thunderhop might be disappointed in this one.